Use HostDime's Infrastructure to Create Cloud Servers in Seconds! HostDime’s never-ending mission is to empower our clients using our unique expertise, global market share, and data center infrastructure to offer the latest in cloud solutions. With that said, it is with great pleasure that we announce the new step in our progression. Check out the following quick walk-through tutorial to see just how easy it is to spin up a virtual machine. Why Choose the HostDime Cloud? This is the ultimate Infrastructure as a Service combination; these virtual machines are on an infrastructure spread across multiple physical servers for maximum scalability and high availability. HORIZONTAL AND VERTICAL SCALABILITY: Scale CPU, RAM and disk space as your application / software / workloads / website grows; handle whatever growth comes your way. Only pay for the server resources you choose. Provision and augment RAM, bandwidth, and computing resources automatically on the fly, no reboot required. HIGHEST OF AVAILABILITY: Gain a competitive advantage thanks to data durability, redundancy, and perfect uptime. These fully redundant hypervisors feature automatic failover! If a local hypervisor is unresponsive, your virtual machines are migrated to a healthy hypervisor. On-demand backup allows you to create and retain multiple backups as desired. We offer a plethora of Operating System templates, and you can upload your own ISO directly. You will also have full console / KVM / IPMI access to each of your virtual instances. We’ll Match Your Credit Deposit! The HostDime Cloud is billed hourly and deducts from a credit system. To begin, make a deposit. You may add as little, or as much, credit to your account as you would like (min deposit is $20.00). For a limited time only, HostDime will match your initial credit deposit! For example, if you put in $1,000, you will receive $2,000 total! There is no maximum to the amount we’ll match! 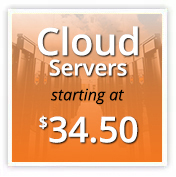 Cloud servers start at just $34 a month! To take advantage of the deposit match, please open a ticket in CORE and we will add your funds; you have 30 days from purchase date to request a credit match from our sales team. The HostDime Cloud will constantly be growing and adding services and available locations. Sign up for our newsletter on the right side of this page, or follow us on Facebook or Twitter for the latest developments. For more information, read the HostDime Cloud FAQ and dive into our extensive cloud Knowledge Base. HostDime.com, Inc., a Global Data Center Company offers an array of cloud products which include managed services for dedicated servers and colocation. HostDime.com owns and operates data centers in Orlando, Florida as well as India, Mexico and Brazil, with facilities in Colombia, Hong Kong, Netherlands, and the United Kingdom.